Axiom - "True professionals do their talking with skill and results." Hot6 GSTL S2 Winners! Talking with Axiom-Acer's Innovation, Alicia and Crank. 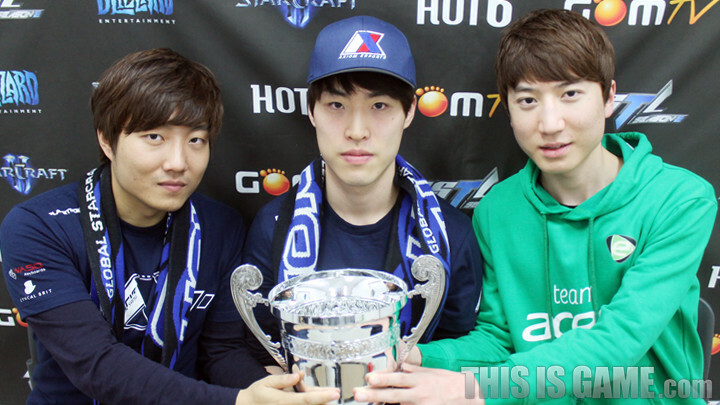 In a series that went all the way to the ace match, Axiom-Acer were able to grab the trophy. Axiom-Acer, on the 23rd at the GOMTV Gangnam Studios, defeated Azubu in the 2nd match, then also defeated them in the final ace match to claim the championship. Congratulations on your victory. I'm curious about how you feel. Innovation: I feel even incredible because we won in such a close match. There were moments where I felt that we had lost. Being able to comeback from a situation like that makes it feel that much better. Crank: We prepared hard, but yesterday we just didn't have a lot of luck. It felt like every build that we prepared got sniped. It was really difficult, but we worked hard to lift the mood in the team and I think that led to todays results. I feel amazing. You must have been so nervous. Innovation: In the case of Frost, I thought I had pretty much lost. I put all my hope into building enough Hellions and Vikings for victory and I was just able to make enough to win. I had a lot going for me in the ace match, but I didn't cope that well and won in a difficult match. In the first series of the finals, you lost 1:4. Crank: After the match-ups were announced, I practised defending a proxy 11/11 rax about a 100 times. Just before the match, I switched my build around and I faced an 11/11 rax. I could have won if I had believed in myself, but I left a lot to be desired. I think that made it harder. The mood must not have been great after losing the first series. Crank: Because everybody in the team has a lot of experience, we knew that it wasn't over. We had a lot of confidence that we could win today, and I think because of that we were able to be the champions. Innovation: When I won Proleague with STX, I felt that I played the role of Ace player for the team. Today, when I was in the booth playing the final Ace match, for an instant I thought about being the Ace on this team too. I decided that I had to be the Ace on this stage too, and I think I was able to focus better because of that. Innovation: I'm not the best at TvT so I felt a bit of worry, but I didn't feel like I was at a disadvantage to Supernova in terms of skill or experience. I took confidence from that, and I was able to win. Crank: Every player on the team is strong mentally. They don't follow other peoples opinions and believe in themselves, and I think that's the driving force behind us getting here. Innovation: Originally, I was intending to attending the Hot6 Cup but my team wants me to attend ASUS ROG. If I had known my schedule a little earlier I would have controlled it a bit better, but it was too late. From DH Winter to Teamstory Cup, the scheduling made the foreign tournament make sense. Most of the formal tournaments have now finished. What are your plans for the future? Crank: Like just mentioned, because there's Teamstory Cup I'm planning to go over to Germany. There'll be a little chance for rest but I don't think much will change. Innovation: I think I'm weak against players that I'm staying with. (laughter) I'm concentrating more on enjoying the games than winning, so I'm not too fussed about it. Next years plans for WCS have been announced. Crank: Although the prize money and season finals have changed a lot, if your results don't let you participate at that level then there's not much to much to argue about. If you are a player with skills, then I don't think it matters. Our attitude is one of not paying attention to these things and trying to do the best we can in the present. Any final thoughts to finish off? Innovation: I feel really happy about winning the GSTL. I want to thank our supporters, and I hope that you give Axiom-Acer a lot of love in the future. I want to thank Team Acer CEO Uwe. Alicia: I'm really happy that a lot of fans came out to see the final, and that it turned out to be such a good match. I just wish that I had been the one to finish things off for my team (laughter). If we're here for another season, I would like you all to cheer like you did today. I want to thank our sponsors wasd keyboards, Planetside 2, Cynical Brit and John and Jenna Bain. Crank: I learned a lot from the more veteran gamers. I learned that a true professional speaks with their results and their skill. I think with this result, I can say this confidently. There was a lot of hardship getting here, so I want to thank John and Jenna Bain for their help and I want to tell them that I love them. The last two games were stuff of legend. Easily my personal favorite team league finals so far! Oh goddamn it, this is why I should translate things when they come out instead of a week later! All credit to weirdkid for actually being on the ball. On a sidenote for those of you who read these interviews, feel free to message me when there's something that you'd like translated! I don't keep up with fomos/naver/tig regularly so if it's not the standard WCS KR interviews I'll basically always miss them. I'd think this one is better because it's a translation instead of a translation of a translation.